هكذا ودعت أم فلسطينية ابنها الذي اعتقله جيش الاحتلال الإسرائيلي.. آخر كلمات للشاب الأسير قبل خروجه من منزل ذويه: (كله فداء فلسطين). Mohammed smiled and raised his fingers in the “victory” sign as he was taken from his family home surrounded by occupation soldiers. Manal later reported on Facebook that her son is currently being held in the infamous Petah Tikva interrogation center. 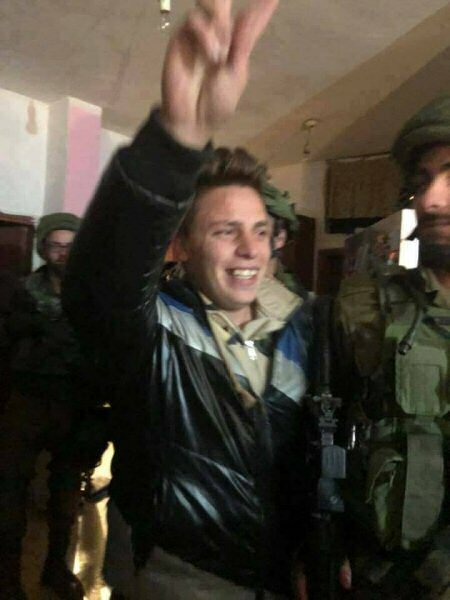 He is the latest member of the Tamimi family to be targeted in an ongoing series of raids and and arrests in the village of Nabi Saleh and the neighboring village of Deir Nizam, both near Ramallah. Nabi Saleh, a village of 600, has become a center of popular organizing and indigenous land defense after the illegal settlement of Halamish has stolen the village’s agricultural land as well as its spring. Ahed and Nariman’s imprisonment has drawn international attention; Ahed’s cousin Nour is also facing several charges before an Israeli military court. The military courts have a conviction rate of over 99 percent, and the two women are charged with incitement for political posts on social media, “assault” on an occupation soldier on their family’s land, and throwing stones, among other allegations. The “assault” charges refer to the livestreamed interaction in which Ahed and Nour demand an occupation soldier leave their home; he was attempting to move to higher ground on the family’s land in order to position himself to shoot at demonstrators in the village. After being slapped by the soldier, Ahed slapped the occupation soldier with her bare hand. Ahed’s 15-year-old cousin Mohammed was shot in the head by a rubber-coated metal bullet and was in a coma for days; he continues to struggle with serious injuries. Last week, another Tamimi cousin, Musa’ab, 17, was shot and killed by occupation forces in the village of Deir Nizam, the first Palestinian killed in 2018. 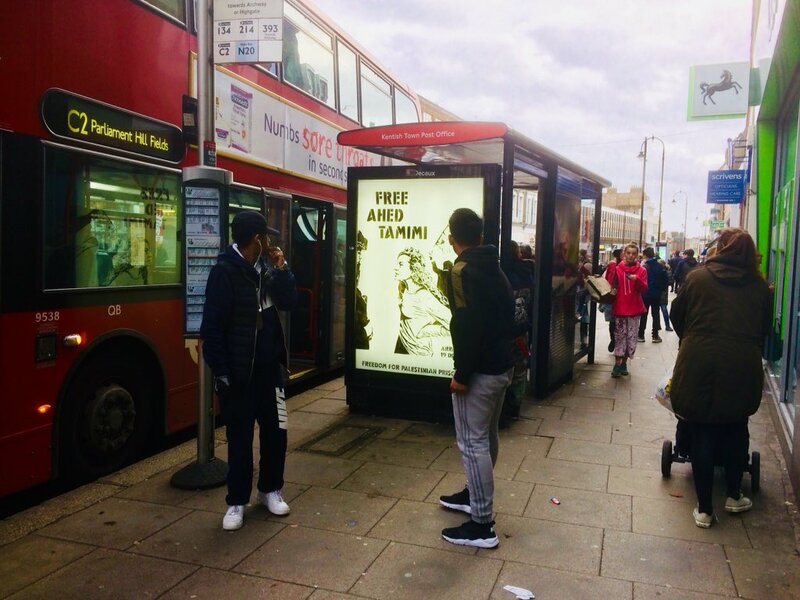 As the repression targeting the Tamimi family has continued and intensified, Palestinian and international support for Ahed Tamimi and her family has only grown. Ahed, who has traveled to South Africa, Europe, Lebanon and elsewhere to speak about the Palestinian struggle, is an internationally-known leader in the indigenous land defense movement. She has been involved in the movement in Nabi Saleh since she was only 11 years old. Protests are continuing around the world to demand Ahed’s freedom and that of the other 6,200 Palestinian political prisoners in Israeli jails. Upcoming protests are scheduled in London (on both 12 January and 13 January), Saint-Etienne, Brussels, Rosario, Montevideo, Sydney, Toulouse, Dublin, Braga, Porto, Lisbon, Rome, New York City, Portland, Copenhagen, Berlin, Washington, DC, Arlington and elsewhere. 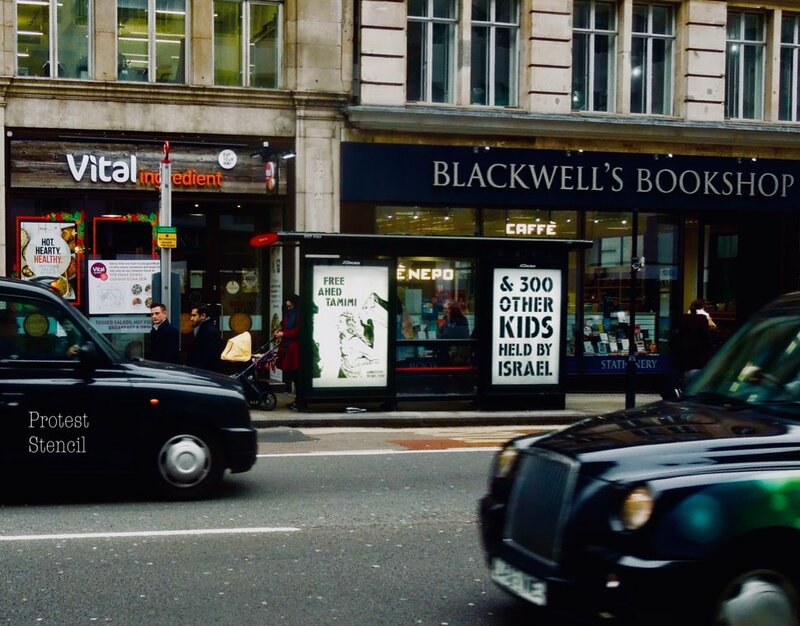 Street visual actions are also taking place to highlight Ahed’s case and the Palestinian struggle for freedom. In London, grassroots activists put up “guerilla” transit ads and posters on bus stops and Tube trains throughout the city. @Protestencil on Twitter has made the stencil-style posters available for download and use in supporters’ local cities. 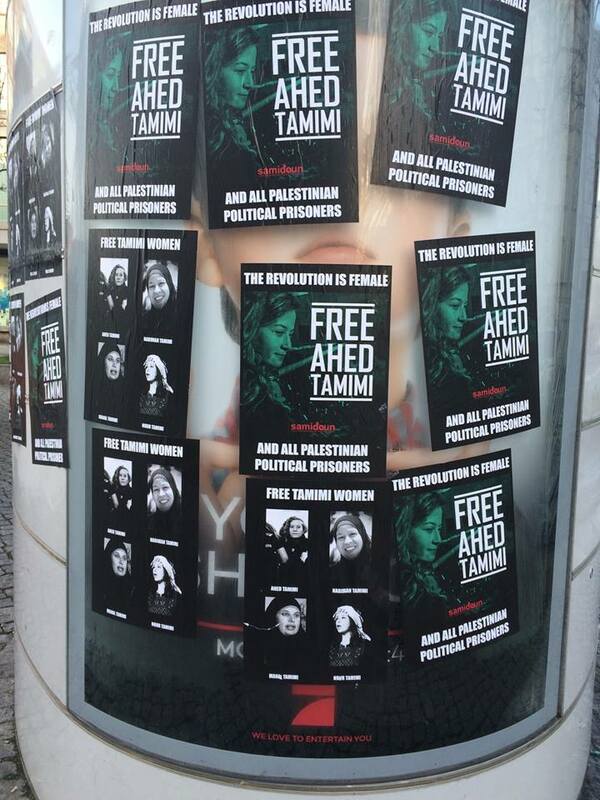 On the streets of Berlin, Jewish Antifa Berlin shared images of large stickers and posters highlighting Ahed Tamimi’s case and those of the Tamimi women posted on signboards and advertising spaces around the German capital city. Women in Berlin are also organizing a bloc for the women’s march on 21 January that will highlight Ahed’s case. An international action week is taking place from 10 to 20 January, focusing on pressure on national parliamentarians in countries around the world to speak out about the case of Ahed Tamimi, including actions targeting Dutch, French, German and Portuguese politicians. In addition, UK minister of state for the Middle East Alistair Burt responded to questions from Labour MP Julie Elliott on 10 January by noting that “the soldiers should not be there and the young woman should not have needed to do what she did.” This followed an earlier Early Day Motion submitted by a multi-party group of parliamentarians on Ahed’s case. Original article, with action links, via the Samidoun Palestinian Prisoner Solidarity Network.